GitHub - swaggo/gin-swagger: gin middleware to automatically generate RESTful API documentation with Swagger 2.0.
gin middleware to automatically generate RESTful API documentation with Swagger 2.0. Want to be notified of new releases in swaggo/gin-swagger? Add comments to your API source code, See Declarative Comments Format. Run the Swag in your Go project root folder which contains main.go file, Swag will parse comments and generate required files(docs folder and docs/doc.go). _ "./docs" // docs is generated by Swag CLI, you have to import it. // @description This is a sample server Petstore server. 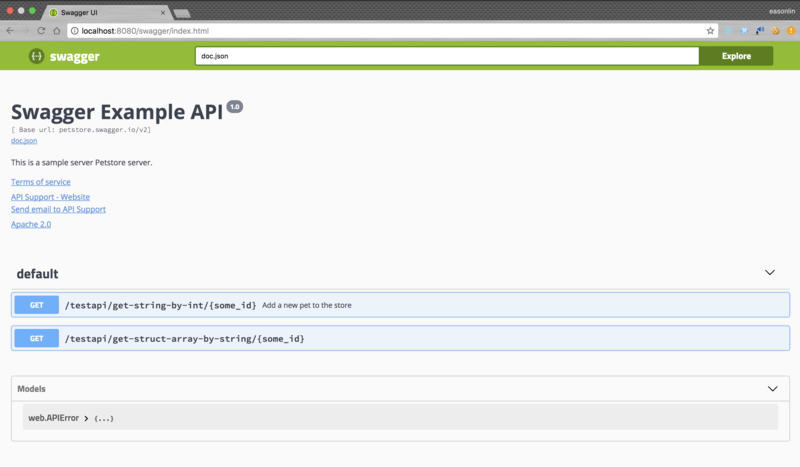 Run it, and browser to http://localhost:8080/swagger/index.html, you can see Swagger 2.0 Api documents. Then, if you set envioment variable NAME_OF_ENV_VARIABLE to anything, /swagger/*any will respond 404, just like when route unspecified.